Even by the standards of a Baltimore murder trial, the one set to start against Queen Antoinette is expected to roll out sensational details and an original cast of characters. The focus will be the leader of the small group One Mind Ministries, which police call a cult. Queen Antoinette ordered followers to starve a 16-month-old boy in 2007 because he didn't say "Amen" at breakfast, prosecutors say in court records. After the boy died and resurrection prayers failed, two members measured him and bought a suitcase, according to prosecutors. The body was put inside, with mothballs and fabric softeners to mask the odor. Four core members drove to Philadelphia, where they wheeled the suitcase until finding a place to stay. Then things got really strange. -- Queen Antoinette: The 41-year-old, also known as Toni Sloan, led One Mind out of a Baltimore rowhouse. She is charged with murder, remains in jail and will represent herself. When asked during a brief phone conversation how she was doing, she pleasantly said, "Blessed," reflecting the appeal that drew people to her. Queen Antoinette wanted to discuss her case during an in-person interview, but state prison officials denied a request from The Washington Post to inverview her in jail. 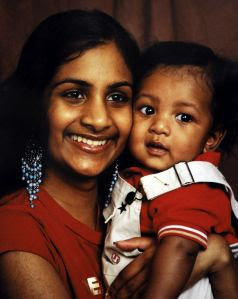 -- Ria Ramkissoon: Ramkissoon, called Princess Marie by the group, is the deceased child's mother. Prosecutors think that she was brainwashed and allowed her to plead guilty to a child-abuse charge. They also promised her that they would drop the charge if Javon rises from the dead. "She still believes that's going to happen," her attorney, Steven Silverman, said this week. But he said his client will give lucid testimony of life in the rowhouse: "She's going to give an accurate and detailed account of her time at One Mind Ministries." -- Trevia Williams: The 22-year-old, referred to as Princess Trevia, also is charged with murder, locked in jail and representing herself. She was one of the members who measured the body, according to allegations prosecutors aired at a hearing. She also is accused of following Queen Antoinette's alleged instructions not to feed Javon. -- Marcus Cobbs: The 23-year-old, known as Prince Marcus and facing a murder charge, joined Williams in buying the suitcase, according to prosecutors. His attorney, Maureen Rowland, said that she doesn't think he was involved with the suitcase and that he wasn't involved in causing Javon's death. After learning of it, Prince Marcus took turns in a prayer vigil at Javon's bedside that lasted at least a week, Rowland said. "They were convinced Queen could raise the body," she said. Prosecutors tried to reach a plea deal with Cobbs to help their case against Queen Antoinette. To Cobbs, however, she is still the person who healed his ankle when he moved into the rowhouse. "He is very, very protective to Queen," Rowland said. "He still believes in her." She said her client is at peace. "He's always smiling. He never gets upset," Rowland said. "I went to see him [in jail] on his birthday. He said, 'Whenever I get down about being here, I think about Haiti, and how any of those people would want to be here.' "
-- Mystery member: Police charging documents say a confidential source told officers about life inside One Mind Ministries and how Queen Antoinette had become upset with Javon. If the source, who appears to be a former member, testifies, that could bolster prosecutors' case against Queen Antoinette. -- Samuel Morgan: The Philadelphia resident, nearly 80 years old and known as Yorkie, befriended the group after meeting Queen Antoinette at a dollar store and let members store their luggage in his shed. About a year later, after the group had established itself in Brooklyn, N.Y., detectives appeared at Morgan's house, and he opened the shed for them. -- Bernard Stokes: It is unclear whether he will testify, but the rowhouse landlord could give an outsider's insight. Stokes, who knew a man staying at the home, went to the rowhouse one day thinking he would see only him but instead found six sleeping pallets and a group of people singing, praying and addressing each other as royalty. "I said, 'Ya'll gotta go,' " Stokes recalled. " 'You can't live here.' "